"Where do new ideas come from? Cognitive innovation and multidisciplinary research training"
The human drive for innovation is insatiable and creativity is highly prised. Yet for many the need to temper the lure of the new by conservation and resistance to change is equally important. How do we reconcile these competing drives? What makes some people creative? And how can we facilitate innovative thinking? These were some of the questions the European-funded project, CogNovo, addressed through its highly ambitious and visionary model of PhD training. In its conception, CogNovo represented new thinking around knowledge production that encouraged creative thinking, innovation, collaboration and mobility across disciplines and cultures and offered research training to an international cohort of 25 students from a range of disciplines including Cognitive Neuroscience, Computational Modelling, Humanities, Experimental Psychology, Creative Arts and Cognitive Robotics. In an extra twist, CogNovo was formulated not only to support research into innovation and creativity within the individual PhD research projects, but also to explore how the programme itself, through its training activities could encourage innovation and creative thinking amongst its researchers. In this talk I will discuss the CogNovo experience from the perspective of participants, both students and faculty, highlighting the best of what we learnt from this process. This talk is open to all members of the University of the Philippines community. Sue Denham is a professor in Cognitive and Computational Neuroscience, a former Director of the Cognition Institute and co-ordinator of Cognitive Innovation (CogNovo), is an expert in neural and cognitive models of perception, especially multi-stability in auditory perceptual organisation. 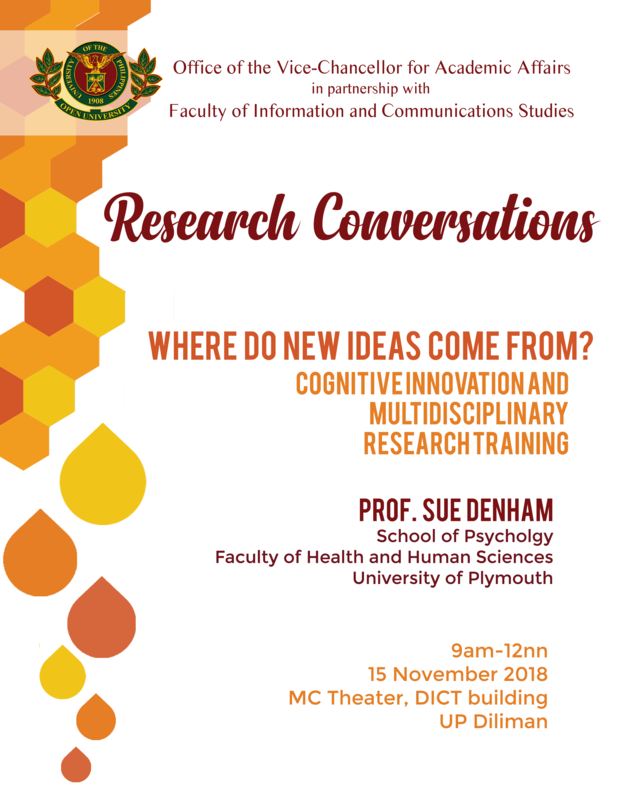 Prof. Denham’s talk is part of the Research Conversations series at UP Open University, presented by the Office of the Vice Chancellor for Academic Affairs and the Faculty of Information and Communication Studies.